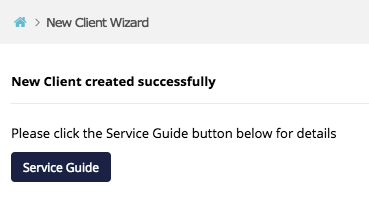 How to use the New Client Wizard to successfully create a new client in Connect. The new client wizard is used to create, or schedule the creation of new clients. You will also be able to add the relevant services to the customer. It is located in the left hand menu bar, any client created will be added to the client you have selected from the right hand dropdown menu. Company Name: Input a company name into this field and Connect smart search feature will find the client's registration number and website, and populate those fields for you. If you do not want Connect to do this, check the Skip Auto Search Button box below the input field. Company Registration Number: This will be auto populated by Connect's smart search function (see Company Name above) or you can enter a client's registration number here. Website: This will be auto populated by Connect's smart search function (see Company Name above) or you can enter a client's website address here. Service start date: The client will be created and services will be provisioned immediately if you select today's date. If you select a date in the future then services will be made live at 1am on the selected date. Service end date: By default this is set to one year on from the scheduled start date. This can be changed before continuing or in the future. The end date has no impact on client services ceasing, it's simply used to help manage room allocation. Client type: A residential customer is one that resides in your building. A Virtual / Lounge customer does not, but might want to utilise your Lounge Wi-Fi network , or take telephony and other services from you. If your client is residential, please select the office(s) you wish to allocate to them. If you need to amend any of your offices or workstations, please do this first on the Building page. If your client is residential, an Available Offices section will appear. Please select the office(s) you wish to allocate to the client from the left hand box so that they appear in the Selected offices box. The number of workstations in each office appears next to the office name, this usually indicates the number of floor ports in the office. If you need to amend any of your offices or workstations, please do this first in the Building page. Note: if your client is going to work from a shared space (Co-Work) you do not need to select an office. Account Number: Here you can enter an accounting reference number, which will be allocated to the customer and appear in billing reports and other information that can be found in Connect. This is useful if you want to synchronise Connect based information with other management or billing systems you might use. If this field is left blank Connect will generate a number for the client. Active workstations: Enter the number of desks the client will be taking. This will be used later to help calculate required services. Client's Title, Name and contact details: Will be saved in Connect for your reference at a later date. Invite user to Connect: You have the option to send an invitation to join Connect to the email address entered above. Here you can add the services that you will provide for the customer. This shows the cost from essensys to you, as well as the price you charge the end client. You can edit the price to clients. Use the search boxes to quickly locate a service. Highlight a service you want to add, click + and adjust the quantity in the basket on the right of the screen. Further information about each service is shown in the footer at the bottom of the screen when the service is highlighted. Once you have finished adding the relevant services, click next to confirm your selection. The next step allows you to allocate floor ports for voice and internet services, and have them be automatically provisioned by Connect. This step relies on your patching records being accurate. If you are not confident that your patching records are accurate, select Next to complete the client creation process, and then proceed to the Building page to make any necessary changes to patching. You can read more about updating your patching in the Floor Ports section of the Knowledge Base. To continue with the client creation process once you are happy that your patching records are correct, go to the Clients page, find the client and click Awaiting Provisioning in the status column. Here is where you will see all the floor ports in the rooms that the client is moving into. Your patch list isn’t an accurate reflection of what’s in your comms room, and so Connect thinks the floor port is connected to the wrong switch port. At this point you can cancel the automatic provision and go to the Building page to make any necessary changes to patching. You can read more about updating your patching in the Floor Ports section of the Knowledge Base. To continue with the client creation process once you are happy that your patching records are correct, go to the Clients page, find the client and click New in the status column. Your patch list is up to date, and Connect thinks the switch port is being used by a customer that has since moved out. If you are confident the customer has moved out you can go ahead an allocate the port to the customer moving in. Click on the text in the Client column of the port you would like to allocate. 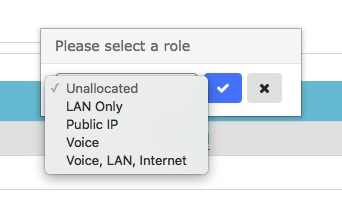 The Role will default to Voice, LAN, Internet. ​To allocate multiple ports or set a port role other than Voice, LAN, Internet. Public IP - Allows the use of a public facing device. You will only be able to assign this role if the client has been given a public IP service. 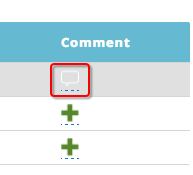 You can view and edit comments by clicking on the icon, editing the text and clicking the tick. If the client requires a main line phone number, please see the article entitled "Amending Main Line Numbers"